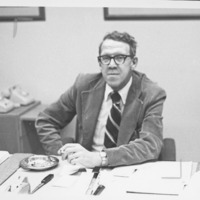 Arley Jonish was the college librarian from 1966-1989. He oversaw many changes to the library, including the addition of the Stuart Wing in 1974. “Arley Jonish,” Whitman College Archives, accessed April 24, 2019, http://www.whitmanarchives.org/omeka/items/show/6. For more information, please contact archives@whitman.edu. Finding aids, visitor information, and currently digitized collections are available at http://www.whitman.edu/archives.